Labor said we would fail, but we nailed it – 1.1 million jobs within five years and we are now past 1.2 million jobs. Today, I am making a new jobs pledge for our government, to see 1.25 million jobs created over the next five years. …[with] continued good management, our debt can be eliminated within the decade. At this next election, only half of those of voting age will have experienced a recession during their working lives. So it is important to remind all of us that our economy cannot be taken for granted. Over five years, we have repaired Australia’s fiscal position. We did this without slowing the economy or harming jobs growth. You’ll be deciding the economy you and your families – your children and grandchildren – will live in for the next decade. And the consequences will be real. Labor and Mr Shorten are offering you a weaker economy to live in, held back by higher taxes. Job growth since September 2013 has averaged 18,200 a month, which is marginally above the 17,230 jobs per month created in the decade to September 2013, which also included the fallout from the Global Financial Crisis. However, this level of jobs creation is off a much bigger base than was experienced previously. That is, there were 12,173,000 people in the labour market in September 2013, versus 11,253,900 in September 2008 and 9,985,900 in September 2003. 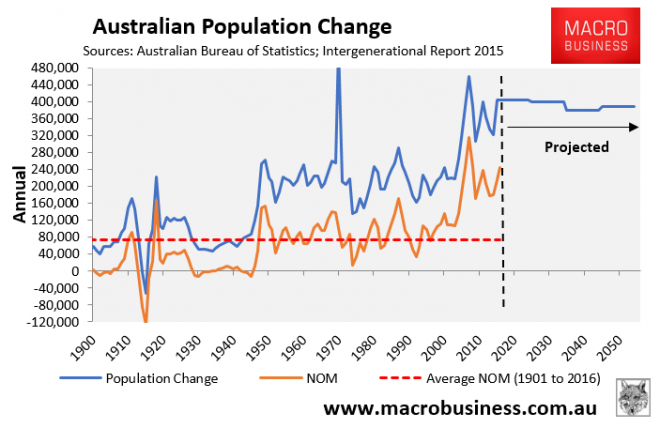 Australia’s population is also growing quickly, which (other things equal) means that employment must grow faster to absorb the additional workers. At current rates there will be another 800k foreign workers in Australia over the next five years leaving a paltry 200k to split between the existing population. As we have observed for the past five years, this level of influx of foreign workers destroys industrial relations rules. It is no wonder then that the underemployment rates was virtually unchanged from November 2013 to November 2018 – i.e. 13.8% versus 13.4% – nowhere near low enough to generate wages growth. The second pledge of paying down net debt is preposterous, especially so when coupled with employment commitment. Over the next five years China will almost certainly slow and commodity prices fall, as well as the world experience a shock of some kind necessitating greater fiscal spending and deficits. This is underlined by the fact that in the past year government created 304,500 jobs, whereas private sector employment contracted by 92,700 jobs. There are no private sector drivers for jobs growth with mining carrying over-capacity and the much vaunted services economy paralysed by deleveraging and the RBA out of bullets. As that process intensifies and the private sector retrenches, if government runs larger surpluses while Australia runs external deficits then the basic calculus of GDP guarantees that growth, jobs and budget revenue will fall. Yet somehow Scummo is pledging to find an additional 35bn per annum to pay off the $350bn in net debt. And they will continue to do so thanks to bracket creep and a Coalition schedule of tax cuts that heavily favour the wealthy. 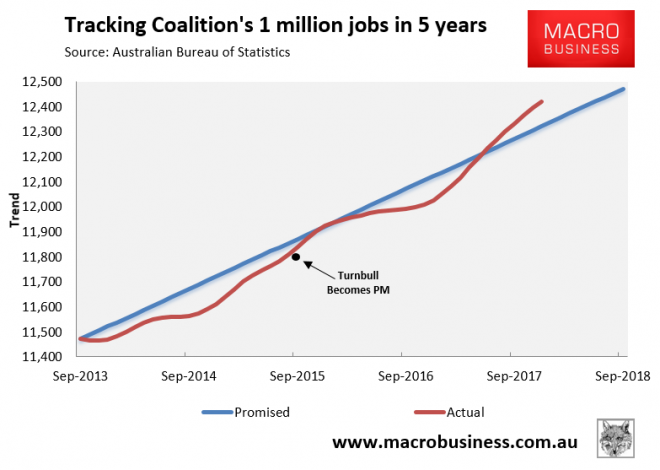 The one pledge that we can expect the Scummo Government to deliver on in spades is a boom in economic lies. — What a croc. The chances of anyone alive today seeing even a dollar of debt reduction is somewhere between zero and f*ck all. Govt and State debt is headed to the moon and will end only with the implosion of the existing monetary system. Period. Won’t somebody PLEASE put this government out of our misery? What they are going to do with explosion of household debt? Govt debt is not an issue …. until it is. The day it becomes an issue will be the end. It’s that binary. Total gov debt is around $550 million. That’s around $22,000 per Australian. It’s a lot to pay back. Rent out the garage on ABNB …work nights as a dabbawallah for Uber eats …..easy mate ! NOM of 200,000 per year over 5 years means he’s found jobs for the 1 million migrants. This excludes ~2 million already here on temporary, bridging and “student” visas. I assume it would also exclude the Australian born kids turning 18 or graduating uni over those same years. The numbers either don’t add up, or are just absolutely horrifying for an economy. I’ve had the same African chap deliver a few times and he is actually a lovely, pleasant and charming fellow. Though he seems to be the exception. so in 5 and a half years of unprecented housing and credit boom they mannaged to create only 30k jobs more than just to keep where Labor left. Youth employment runs at 20 % plus (If my memory serves me correctly) . I’m starting to think that’s one way out of this without becoming Argentina, Ireland, etc in a fair way and using the money for some nation building projects (i.e water infrastructure around Australia, HSR to replace airport fare around the capital cities, etc). Would mean a boost in wages and with incentives to pay off debts over time would repair the household balance sheet. Totally uneconomic projects due to their initial cost but could pay off for many decades for future generations. Most inventions we enjoy today weren’t economic initially either (e.g electricity grid, sewerage, etc) but became economic over time. The other way of course is to loosen lending standards to the limit of serviceability again and make sure that new entrants keep coming in to offload the new debt to (i.e. the old equilibrium) keeping the debt to gdp ratio constant while actual debt levels (and therefore money as income) rise. Different winners and losers though.